Sims Metal Management, the worlds largest metal recycler expanded their operations by developing their new processing & recycling facility is located on Donaldson Road, Kwinana Beach. 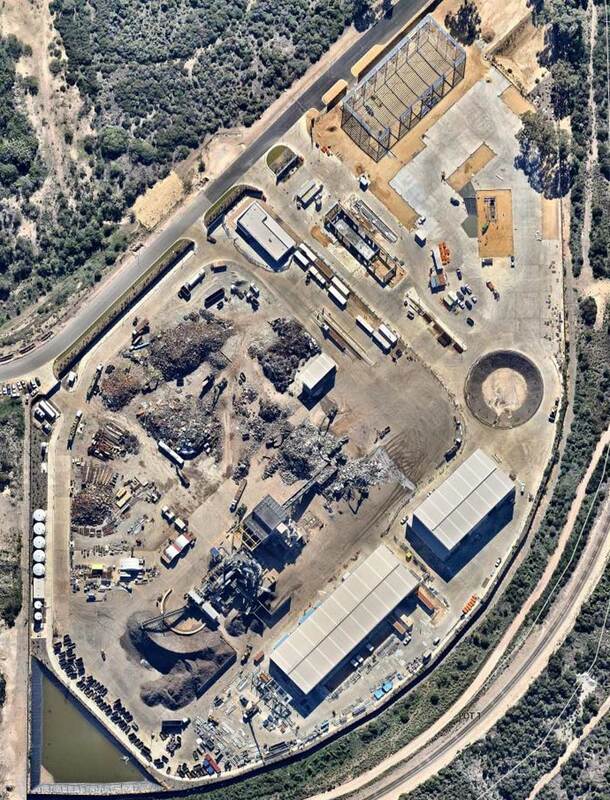 The 100,000m2 site is the largest Sims Metal facility in Australia with the latest, largest and technologically advanced metal shredding machinery that has the capability to processes 130 tonnes of scrap material per hour. The facility also operates a Static Shear, Shredder and Offline Recovery system which processes other ferrous and non-ferrous materials during the recycling process. The buildings on the site consists of administration center, storage sheds, storage bins, warehouses and enclosures for the specialist equipment used in site. The design was the foundation of the shredder, weighing in at 200 tonnes, was intricate as the shredder has one of the largest electric engines in the Southern Hemisphere which is capable of stopping in an instant. This exerts an enormous amount of forces into the foundation system. If this was to occur in an emergency along with the high dynamic forces required to sustain during normal operations, the energy exerted during the shredding process is significant in that a special enclosure was required around the shredder to provide protection from flying debris during operations. This consisted of an inverted exoskeleton like structure where precast panels were located on the inside of an external steel frame. Ground improvements for the project included stripping of dense bush land and significant over excavations to remedy soft ground. Site levels were designed to accommodate required site functions and deliver a completely balanced cut-to-fill site for subgrade earthworks. The stormwater drainage design was particularly complicated, with stringent environmental requirements for the capture, treatment and disposal of surface water, taking into consideration the client’s use of the site. In areas designated as “high environmental risk” zones of the site, a piped system was designed discharging flows to a large gross pollutant system before it is discharged into a lined drainage swale to accommodate storage of the 1 in 100 year storm event. This retained storm water is then treated in a secondary UV system which can be re-used on site for dust suppression, use in the metal shredder operation and on standby in firefighting tanks. The achieve operational requirements, the client required certain operational areas to be constructed using unbound low abrasive materials, to minimize maintenance costs of equipment, but still achieve site drainage environmental containment. This involved a 15,000m2 area to be underlined with a shaped Geosynthetic Clay Liner to capture hydrocarbons and other contaminates and runoff which would be cleansed to avoid discharge of heavy metals infiltrating into the ground..
BPA Engineering liaised closely with manufacturers of gross pollutant traps & geosythetic materials throughout the design phase to ensure local government & EPA requirements were met. A concrete pavement throughout the entire site was designed to cater for the heavy industrial use of the site and for high point loads of specific vehicles used by the client, in particular a mobile 40ft container lifter, as well as the high frequency of fully laden trucks entering the site. Due to the vast extent of concrete paving required, alternative designs of slabs and joints were developed to provide a cost effective & durable pavement that would stand up to the heavy industrial site use.